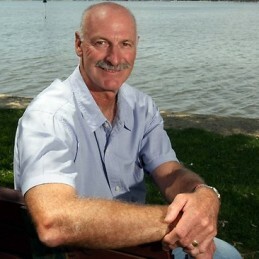 Dennis Lillee is one of the all-time great cricketers and one of Australia’s finest sportsmen. He was considered a complete bowler and for more than a decade was the heart of the Australian bowling attack. Dennis’ skill, work ethic and showmanship won over the Australian sporting public with crowds roaring his name as he charged in to bowl. Dennis was the sort of player and personality that captains could rely on to bowl ‘one more good over’. He often made seemingly unlikely breakthroughs when all was thought to be lost. Dennis broke Lance Gibbs’ international record of 309 Test wickets and finished his career with 355 from just 70 matches. Honoured in Australia’s Test Team of the Century and the Hall of fame, since retirement from playing Dennis has committed to developing new generations of fast bowlers. Up until 1999 he continued to bowl for the Cricket Australia Chairman’s XI against touring sides, still testing aspiring batsmen. His final match against a touring Pakistan side yielded three wickets apiece for he and son Adam.